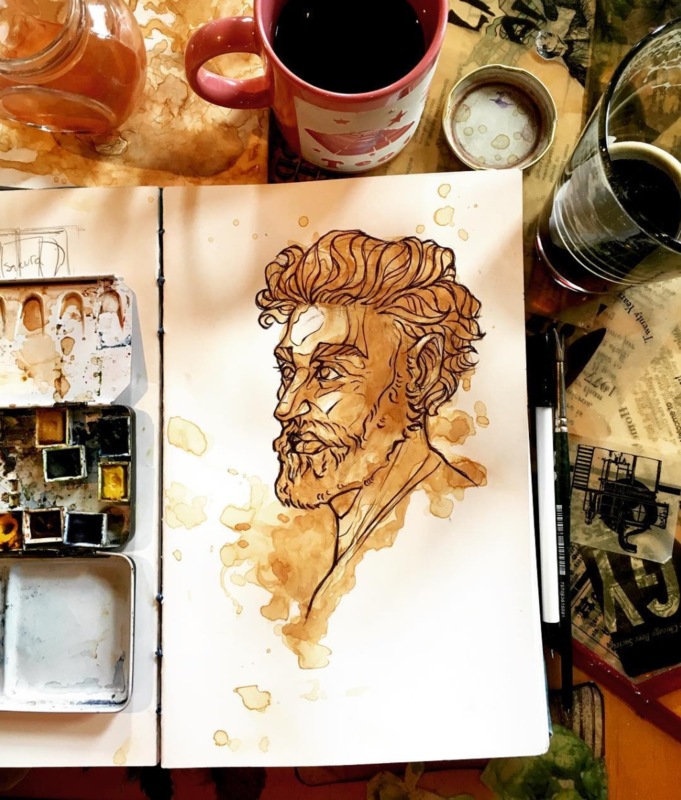 Can you paint with all the colors at the bar? That’s what (I imagine) artist Ali Cantarella thought when she first started painting with coffee, wine, and teas. 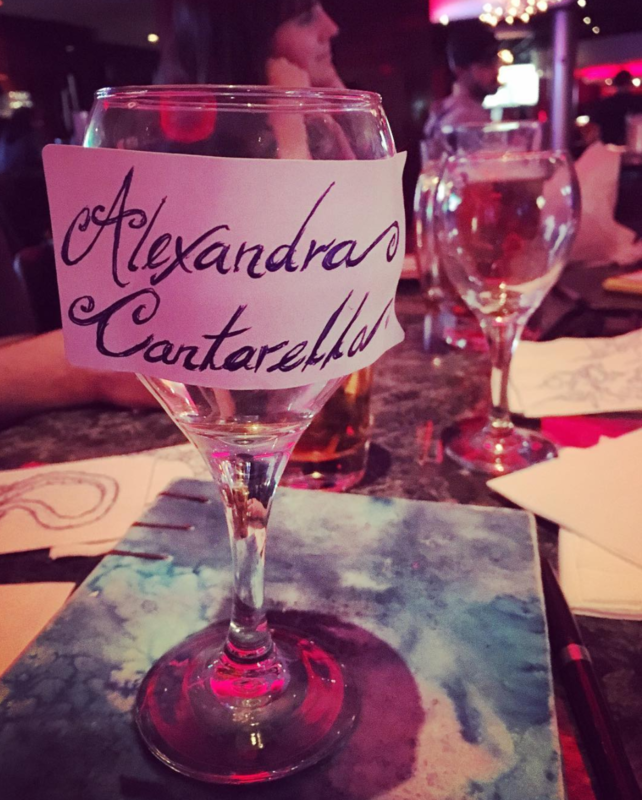 While waiting for a boy at a bar, Ali – to kill time – dipped a paintbrush in her glass of wine and started to paint around with it…with stunning results. 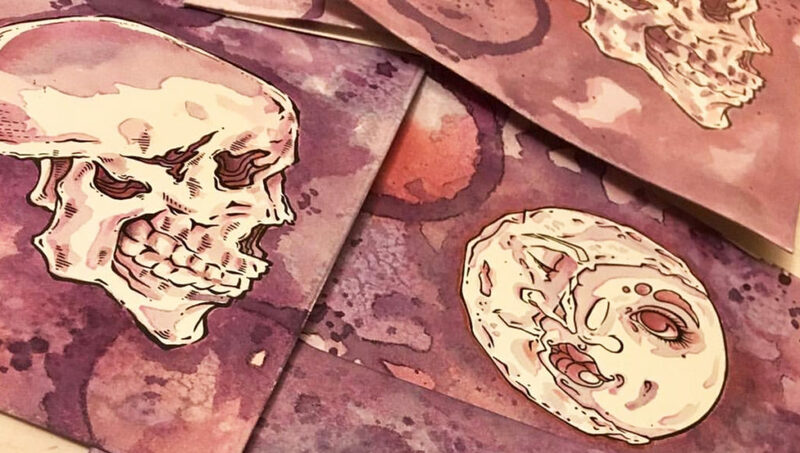 Now, she’s made painting with everything from wine to green tea to pumpkin beer into her own watercolors-with-a-twist style that looks as delicious as the beverages she uses to paint with. 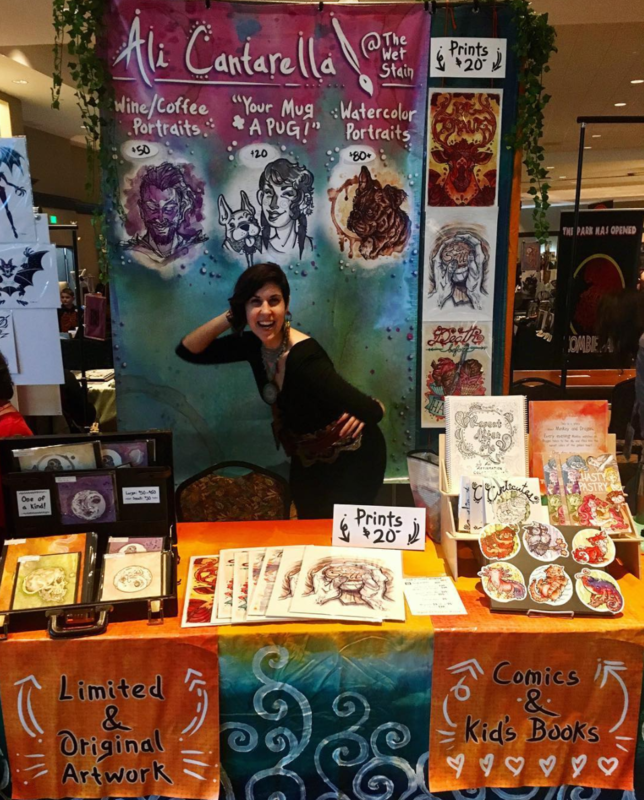 Ali – who goes by “The Wet Stain” on all the social media – just opened up an Artist Shop with us, and we had to talk to her about painting with drinks, her favorite beverage mediums to use, and about her work in comics and caricatures. She’s a pretty cool lady, so check out the interview below! Painting with coffee at a bar in Chicago, The Map Room (via Ali’s Instagram). When did you start using coffee, tea, and wine as ink! What were some of the challenges during the learning process? A few years ago, I was waiting for a boy in a bar and he was ridiculously late. I had my sketchbook, a paintbrush, and a ballpoint pen, so after nervously doodling some flowers I dipped my paintbrush into the wine I was sipping (and trying not to finish before he even showed up). I painted the flowers with wine, let it dry, then went in for a second layer. I found myself loving how the natural sugars in the wine created a viscous sort of layering, and the Bristol of my sketchpad did not allow the liquid to sink in, but to instead sit on top until the water evaporated away, leaving behind rich wine stains with hard, defined edges. I began experimenting with tea, with liquors, and with my most favorite medium – Coffee! What’s the most difficult type of drink to paint with? 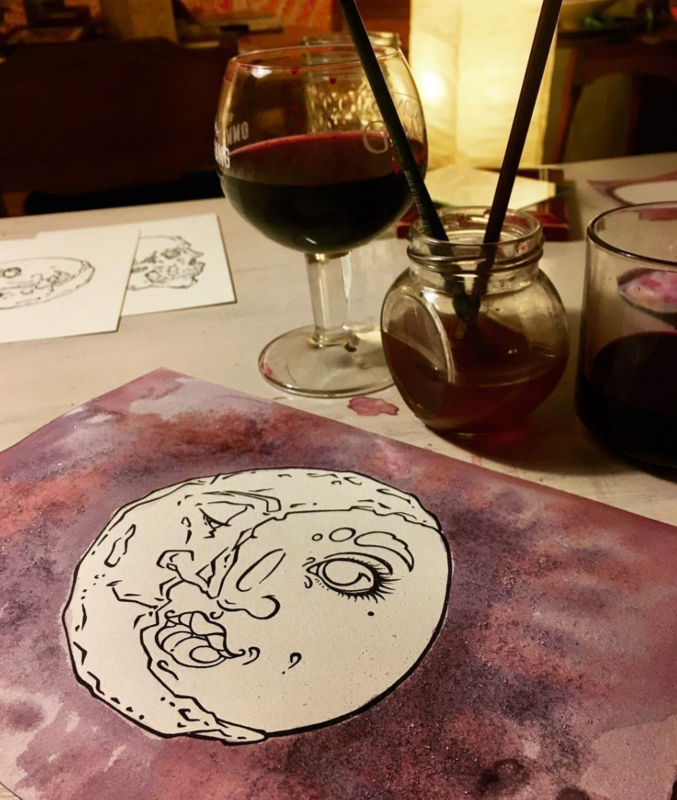 WIP wine painting (via Ali’s Instagram). Wine tends to be the most difficult, but also has the most room to play. 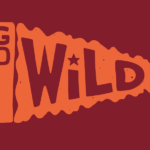 The color of wine shifts dramatically, from when it first stains the paper in deep burgundy or strong purple, to when it dries into a greyed sort of de-saturated lavender. Certain blends can look a lot like blood or rust when they dry, and you can’t store wine the way you can paint because it will oxidize and break down into really unflattering sediments. I love painting with wine because you can make a reduction, and this results in amazingly vibrant deep hues. When I’m drinking or painting, the quality does matter some for both imbibing and illustrating, and I usually select a Cabernet Sauvignon or Malbec. I paint with 1/4 of the bottle, reduce half the bottle, and then have just enough left over to enjoy a glass while I paint. What’s your favorite medium to paint with? To drink? Coffee is beautiful for it’s translucency, and the caramel-y sort of varnish it leaves behind on the page. 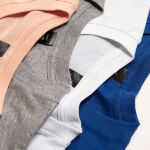 Coffee tends to remain more true to color once on the page, and has a strong capacity for layering into richness. Tea can be brewed very strong to get darker darks, but the color becomes cloudy, like watered down gouache. Coffee is truly the most lustrous of the three alternative materials I use. I like to joke that I start the day with coffee, and end it with wine. If I’m strictly painting with coffee, I tend to add fresh grinds to hot water and let them steep directly for strongest tones and fragrance, but if I’m enjoying a cup of black coffee anywhere I will gladly paint with it. Painting with beverages aside, you also have a really unique art style! When did you start experimenting with caricatures and drawing people? Thank you! I’ve always been interested in comics and took a lot of cartooning classes in College. My professor Ivan Brunetti encouraged us to break people down into shapes, and that really resonated with me. Caricatures and cartooning are a way to condense and create an easily recognizable rendition of a person. It’s less about perfect representation and more about capturing the specific uniqueness that makes a person them. It’s a fun challenge, and makes the entire world my playground so long as I have a sketchbook and a ballpoint pen on the bus, in a coffee shop, in a waiting room, or anywhere! Your illustrations are beautifully detailed – from pencil to ink to final, how long does a typical piece take? A comic page takes me around 10 hours — pencils, inks, scanning, clean up, and color. A large wine portrait can be done in about two hours, which of course is more abstracted and loose, but that’s more than half the charm of the aesthetic. I can do a quick caricature in about 3 minutes, and a ballpoint pen likeness in about 10. The fun of many approaches, be it comics or be it caricatures, in utilizing my skills in different mediums, different time frames, and different levels of “refined”. You’ve done so many live drawing events! What was the most exciting one for you? The versatility of the events makes it hard to choose! 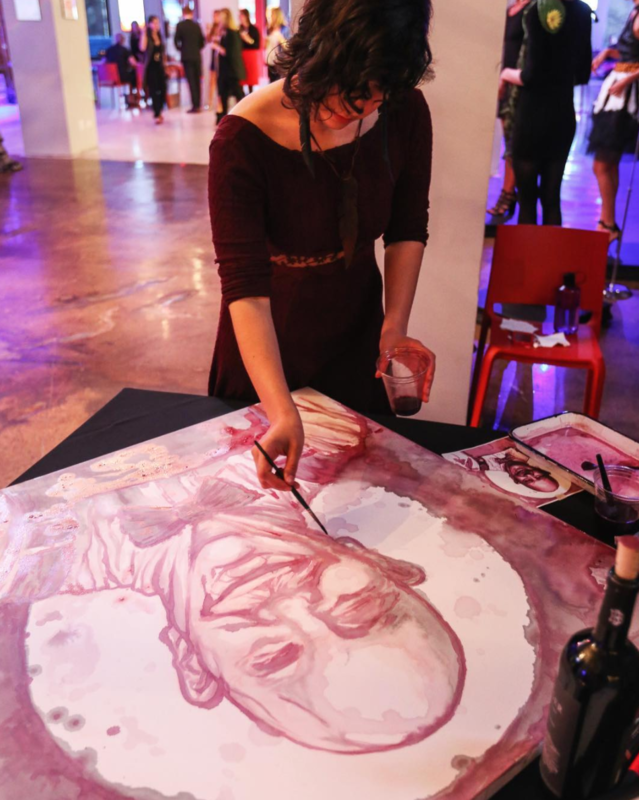 Modern Luxury invited me to their James Beard Food and Wine event in 2016, where I painted a 3′ x 3′ portrait of James Beard in red wine. This was where I met a chef who suggested I start making reductions for my paintings which really changed the game for me. It’s also where I got to eat a lot of amazing food from Chicago’s incredible restaurant scene and meet creative food professionals passionate about their tasty work, so truly a dream come true. On the other hand, doing caricatures of organizations like PAWS Chicago and BarkBox allows me to hang out in rooms full of adorable, wiggly, snuffly puppies for hours while drawing caricatures for charity. I guess it’s a toss up between puppies and food, you know? 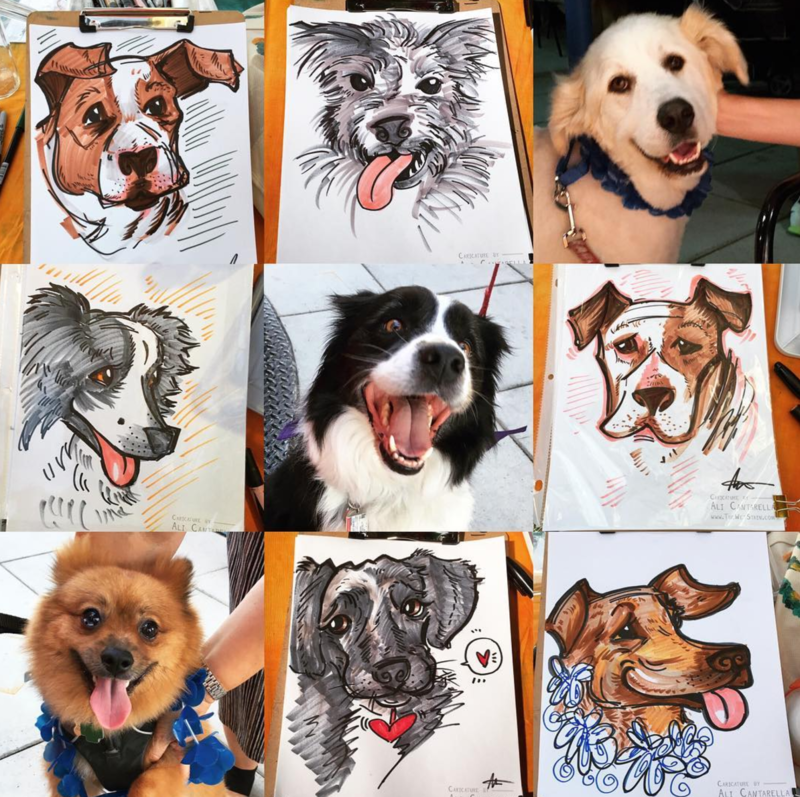 Just a few of the 20 doggo drawings Ali did for PAWS Chicago! Via Ali’s Instagram. You’re doing some work with The Sun Bros on a comic book they’re writing – how did you get started doing comic illustration! What comics have you worked on? 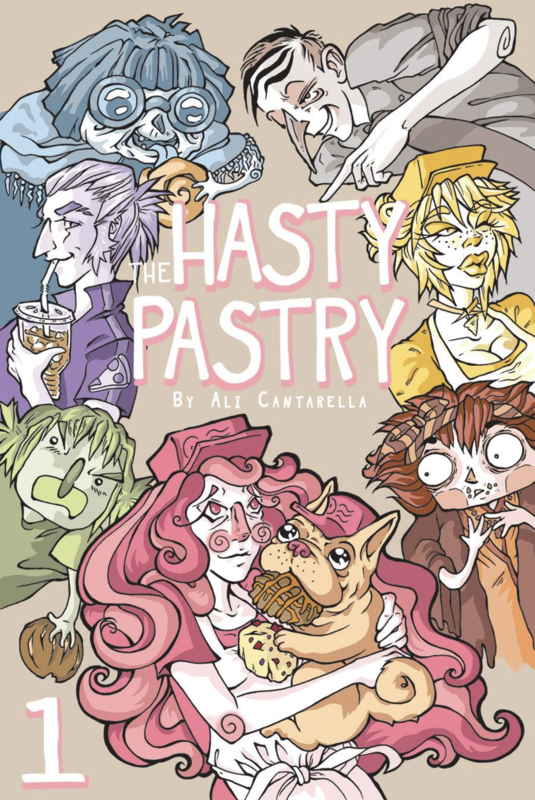 Ali’s comic, “The Hasty Pastry”. I graduated from Columbia College with a degree in Illustration. 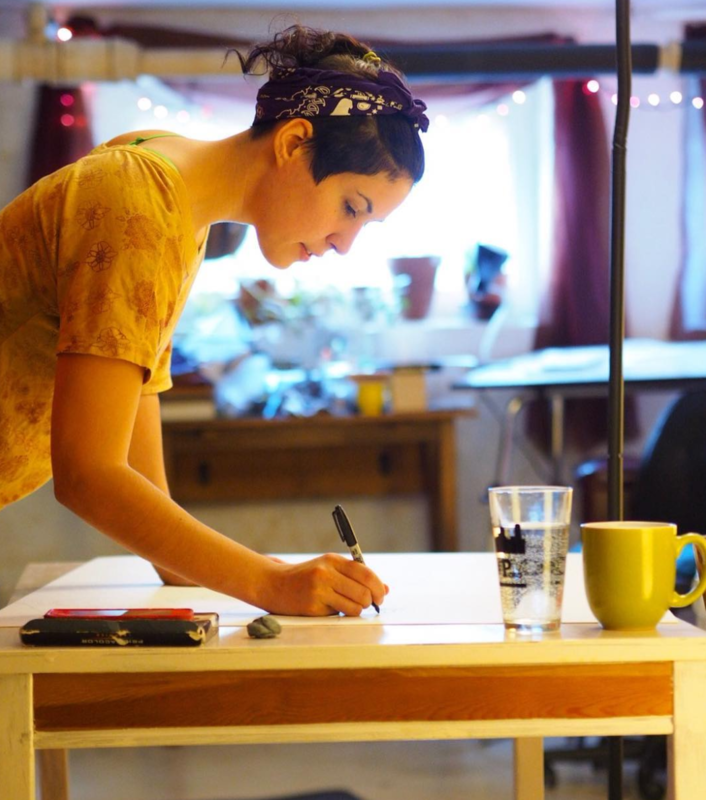 For my senior year, I was a recipient of The Weisman Grant, which matches funds for a creative project. 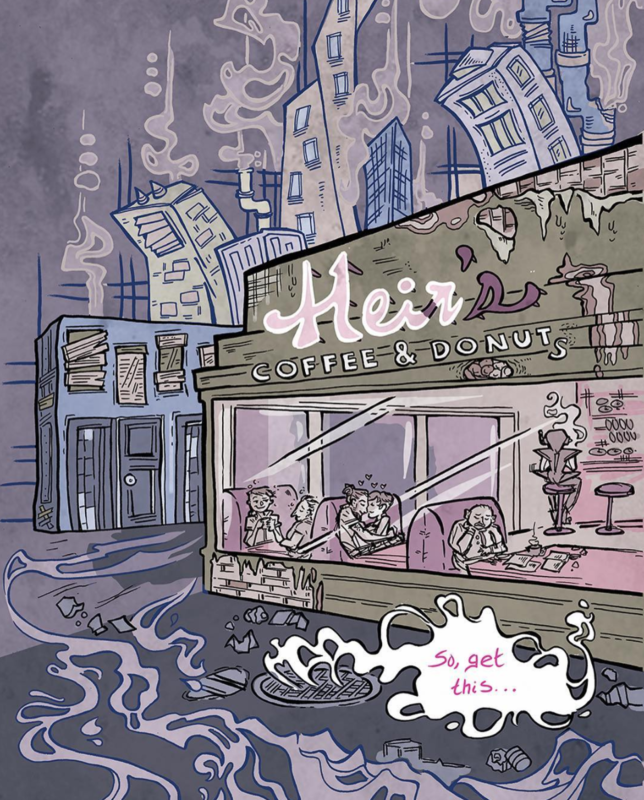 Securing remaining funds with a successful Kickstarter, I self-published my first ever comic The Hasty Pastry – a 100 page, full color vignette style series about a girl named Cat who works in a bakery with her dog, Pugsly. It was inspired by my college years working at Panera, and filled with customer stories, shenanigans, and young-adult woes packaged in pink and delivered with a healthy dose of escapism. After this book, I attended a growing list of comic conventions and library shows, including Chicago’s C2E2, which has now expanded to shows such as New York Comic Con. 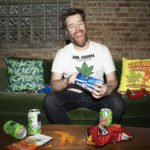 I couldn’t have done any of this without my Chicago community, which included a hard-working group of guys who I would meet with monthly to help each other propel our careers. Yes, comics is a growing inclusive field but, it remains a male-dominated field at present. I know many male creators who I have worked with, whose work I love, and who I anxiously hope to work with in the future! Now that I’ve released several books and collaborated with several writers, I get approached by male writers who note my being female as one of the reasons they want to work with me. They cite wanting “diversity” and a “feminine touch.” None of that was the reason I worked on this epic new project, Eisegesis with the Sun Bros. They wanted the artistry of a person who would bring something unique to the table because of my style, my influences, and our professional history – not because I was a woman. They allowed me to create incredible surreal works, some of which are downright creepy and border on macabre. I look forward to the day when “feminine touch” means drawing a patchwork Quasimodo crushed beneath the heel of a gigantic Spider Queen but, we still have some progress to make. And the Sun Bros are helping make that happen. 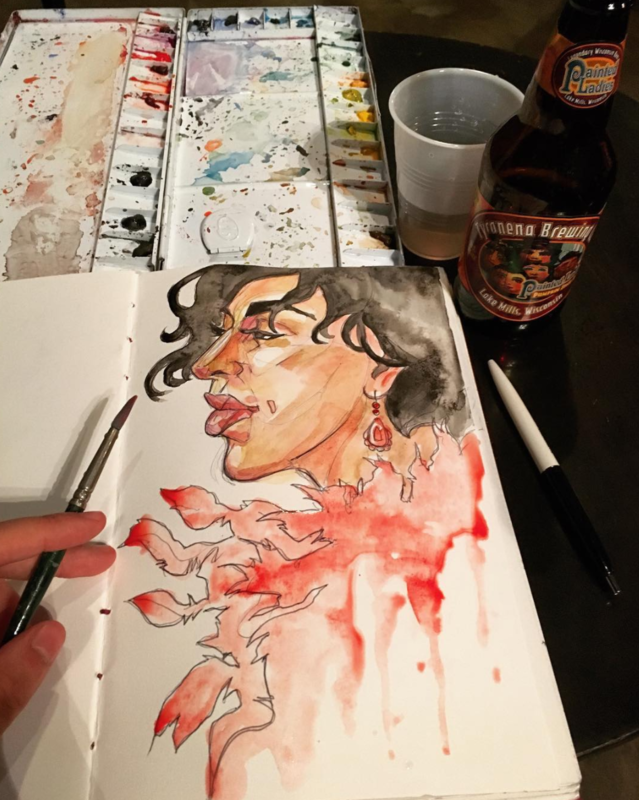 Painting with pumpkin beer at Grotesque Burlesque (via Ali’s Instagram). Between comics, caricatures, and the amazing types of art you do, at the end of the day what’s your favorite kind of illustration/artwork to do? 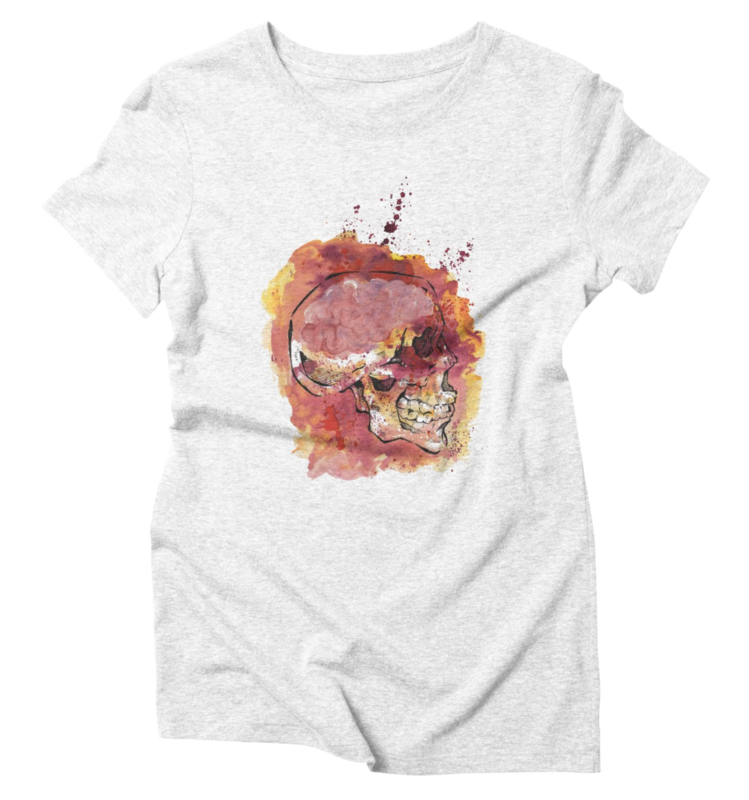 “Bloody Inspired” from Ali’s Artist Shop, “The Wet Stain”! 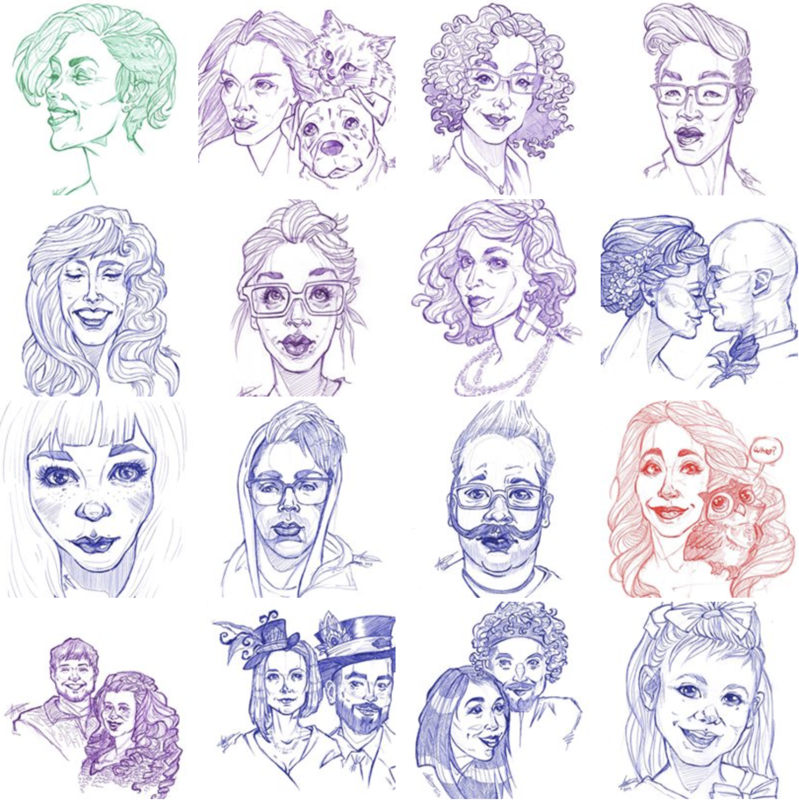 Definitely illustrations of people, caricatures, or portraits of any kind. Portraits help me grow my observation skills, and allow me to connect with people the most. Humans like seeing themselves drawn in a flattering way, which is how I tend to lean, and people seem to connect to human subjects the most even when they do not know the person or the story. They make up their own, or put themselves into the person’s place, and it’s beautiful to see that happen with art. I love comics, but they are a labor of love. The industry right now is not set up to be sustainable for an artist. Honestly, I am most inspired by the people around me. The subtle interactions between a barista and a customer might flesh out an entire comic idea for me, while a patron sitting in a cafe reading a book for a half hour could take up an entire pen and ink page in my sketchbook. I used to take the CTA far more often before I worked from home, and those hours on the bus would fill my brain with stories and my sketchbook with portraits. I also find it exceedingly important to fill the creative well, so I spend a lot of time reading fiction, keeping my imagination working new solutions and creative ideas as often as I can. Children’s books are another great source of inspiration, modern and classic alike. Ali prepping a piece for 57 Street Books’ interactive kids day (via Ali’s Instagram). Also, having friends around who are much better at something than me is the truest fire of inspiration. Keep people around who push you to be better! 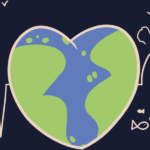 You know– if you’re the biggest fish in the pool, expand to a bigger pool, etc.! Now… to go drink some coffee and paint with some wine! Or you know.. the other way around. 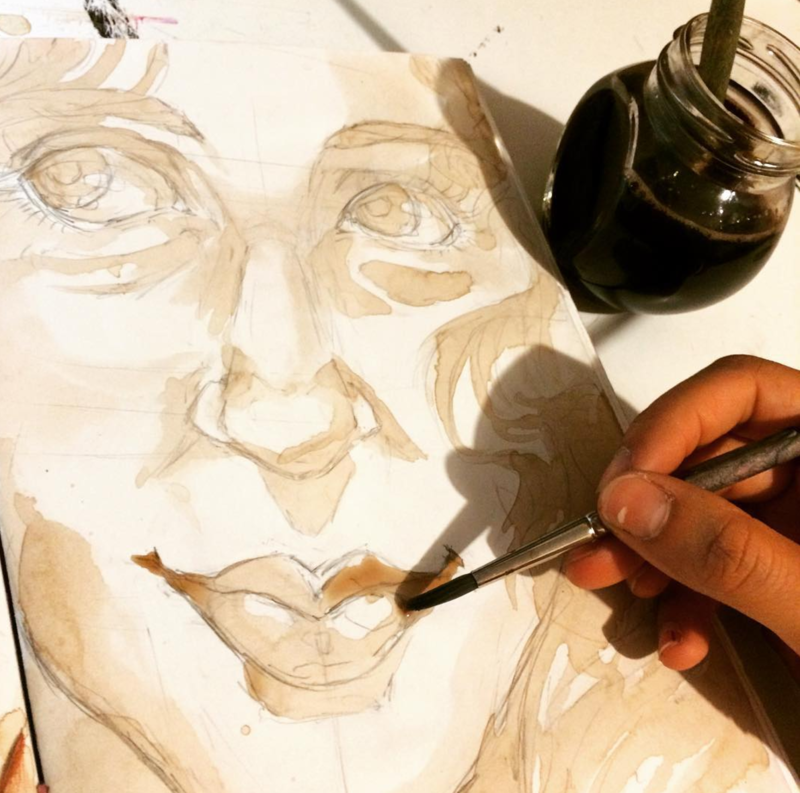 Posted in Blog, Spotlights and tagged Ali Cantarella, coffee art, coffee painting, tea painting, watercolors, wine art. Bookmark the permalink.